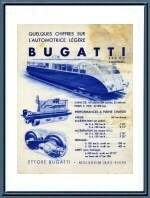 1930's Bugatti Automotrice / Autorail / Railcar Leaflet. 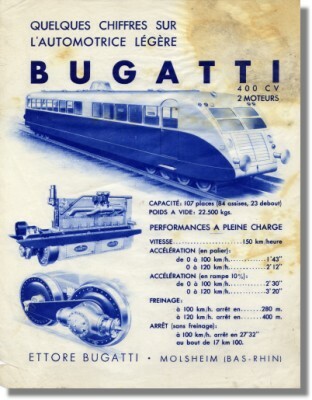 This is a vintage 1930's publicity leaflet for the Ettore Bugatti designed & build Railway Car. It shows the Automotrice Legere itself, the Bugatti Royale Type 41 derived engine and the revolutionary drive system. Furthermore it shows some technical details. It is printed on very thin paper. Unfortunately, it has a large coffee stain, hence the reduced price. It measures some 21 x 27 cm or 8.3 x 10.6 inches.